On my birthday eight years ago, I predicted who the Raptors would take with their first pick in the NBA draft. The writing was on the wall. The Raptors would choose Benetton Treviso forward Andrea Bargnani. As the years progressed, there were highs and lows, but mostly lows. This culminated in the 2012 Christmas Day fight, documented with photographs here. Trust me, it's worth the click. My brother Ryan praised Bargnani and considered him a huge asset, even comparing him to Dirk Nowitzki. In episode 2 of my brother's defunct sports podcast, we revisited the passionate argument. In January 2013, we got a taste of what life would be like without Bargnani, and it was glorious. This season, we're seeing what life is truly like post-Bargnani. This wonderful video explains all. Yes, the Rudy Gay trade was an important factor in the Raptors' recent success, but getting rid of Bargnani was the catalyst. I watched the Raptors easily dispose of Washington last night and they now lead the Atlantic division by four games. More importantly, they're great fun to watch. As I recently wrote, this team I love! Sorry Ry, but I was right about Bargnani. He's junk. On New Year's Eve, I was at a party with my slo-pitch teammates. At the time, I wouldn't miss a Leafs game, but hadn't really paid attention to the Raptors since their hot streak after acquiring Rudy Gay last season. My friend Mike Kic convinced me to give the Raptors another shot, explaining that they're playing as a team following the trade of Rudy Gay to Sacramento. The first game I watched was on New Year's Day, a 95-82 win over a very good Indiana team. Then there was a blowout win in Washington followed by a very close loss in Miami against the defending champs. Kic was right. This Raptors team was different. With Bargnani gone, no player on this team makes my blood boil. With Gay gone, the sum is greater than the parts. Kyle Lowry is playing amazing, unselfish ball, and the end result is a team that's very easy to like. 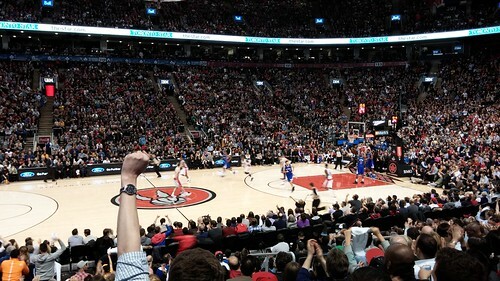 Last week, in Brooklyn, the Raps won with a late steal and selfless pass from Lowry to Patterson. I don't think I'd ever seen the Raps win like that. On Friday night, I watched them win convincingly in Denver, and they battled back from a 19-point deficit to nearly pull off their first win ever in Portland. This team is good! The starting five of DeMar DeRozan, Kyle Lowry, Amir Johnson, Terrence Ross and Jonas Valanciunas have won me over, and suddenly the Raps have a deep and solid bench. The Jays tried to force the hastag #LoveThisTeam on fans, but it's the Raptors who deserve it. Kic was right, I love this team! 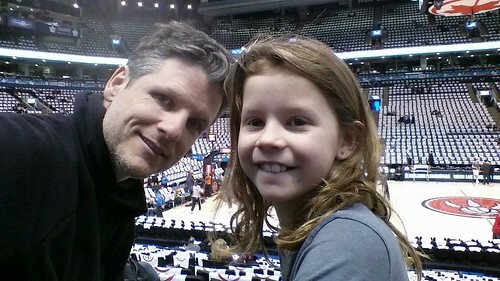 My daughter and I were at the Raptors game tonight to witness Terrence Ross score 51 points and tie a franchise record. 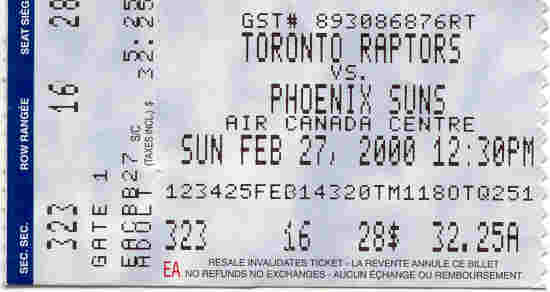 I was there the night Vince Carter scored 51 back in 2000. Here's my ticket stub from that game. It sort of blows my mind that I've been at the ACC for both games to feature 51 point games from a Raptor, considering I don't go to many Raptors games. If anyone is good at math and wants to do the calculations, I've probably been to 12 Raptors games in my life. I'll bet the odds of seeing both 51 point games are pretty miniscule. We were actually tied with the Clippers at 102 late in the fourth quarter, making this an incredibly entertaining game. My daughter loved it, including the half-time performance of "Whoop! (There it is) by Tag Team. A big thanks to the awesome people at Ford Canada who gave me these tickets so I could take my buddy. My buddy wasn't feeling up to it tonight, so my daughter happily pinch hit. Where's Your Messiah Now, John Salmons? The Toronto Raptors made a big trade yesterday. Rudy Gay, Aaron Gray and Quincy Acy have been traded to the Sacramento Kings for guard Greivis Vasquez, swingman John Salmons and forwards Patrick Patterson and Chuck Hayes. With John Salmons now a Raptor, you have to wonder what god thinks of all this. Back in 2006, Salmons walked away from a verbal deal with the Raptors because of god. Originally, I felt like I had to make a decision," Salmons said. "But I didn't really feel [Toronto] was where God was leading me..."It was hard to tell [Bell], but I had to," he said. "It took all the courage in the world. I had faith something good would happen, but I'm human like anyone else; I was still nervous. I tried not to worry. Joel was pulling out his hair. Then a couple days later, he told me Sacramento had called... I slept on it. It felt right. Tim Leiweke, the new CEO of Maple Leaf Sports and Entertainment, seems to be open to a Raptors re-branding. I will acknowledge that we absolutely have had conversations about the colour and make-up of our brand, our uniforms and our image. Now's the time to erase one of many mistakes made by the Toronto Raptors since we were granted an NBA franchise. At the time, Jurassic Park was all the rage. Kids naturally love dinosaurs, and Jurassic Park was so damn cool, dinos were everywhere. We were essentially named after a fad. 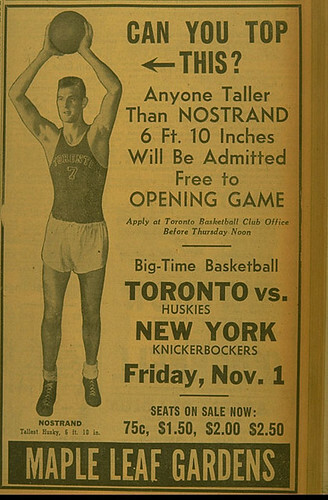 At the time I wanted our team to be named the Toronto Huskies because we had a team named the Toronto Huskies in the Basketball Association of America during the 1946-47 season. It's a cool name with history so I thought it was a slam-dunk. I was wrong and the Jurassic Park fad won the day. Now's our chance to correct this oversight. It's time to change our nickname from Raptors to Huskies. Let's be the Toronto Huskies! I was at the Heat game this afternoon. It really was a tale of two games. 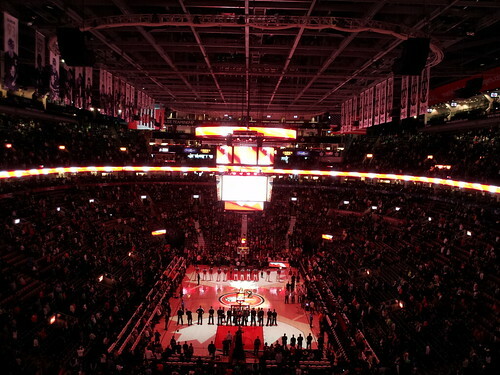 Early in the fourth quarter, after battling back, the Raptors managed to tie the Miami Heat. The ACC went nuts. Seriously, it felt like a playoff game. The Raps were going to end Miami's winning streak at 21! Then, in what seemed like a blink of the eye, we were down by 20. It all fell apart so quickly... Miami has now won 22 in a row. 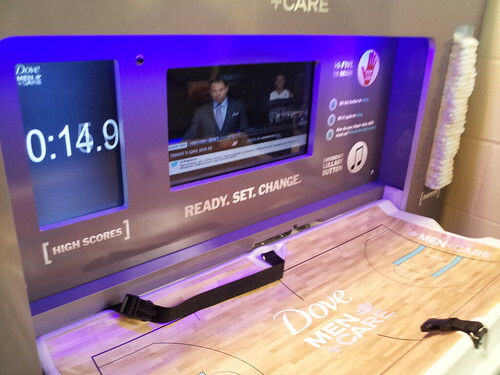 We were at the game thanks to Dove Men+Care who wanted to demonstrate their Ultimate Gameday Change Table. 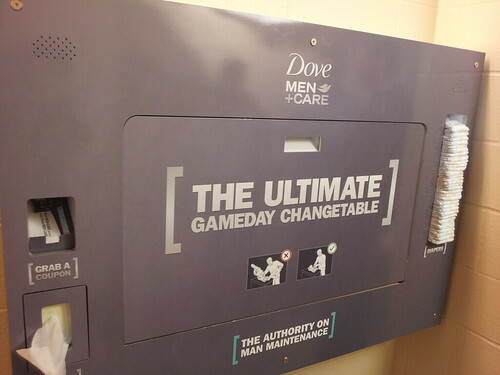 It was a souped-up change table for sporty dads. There's a timer, emergency lullaby button and even rankings of the fastest changers. P.S. Amir Johnson rules. That is all. Following the Leafs 3-0 over the Sens, I got sucked into watching the NBA all-star competitions. 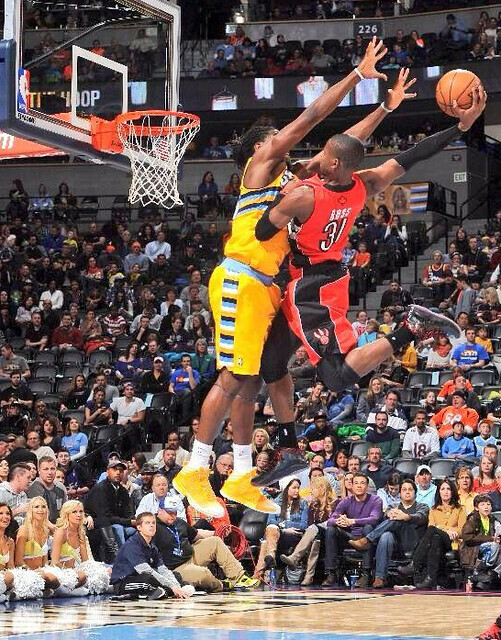 I had a rooting interest with Raptor rookie Terrence Ross in the slam dunk competition, so I got into it. Ross won becoming the second Raptor to do so following Vince Carter's win in 2000. Ross actually paid tribute to Vince with his first dunk in the finals last night. Then, he sealed the deal using a young boy as a convenient prop. Full points to Ross for the win, but I miss the good old days when props weren't part of every second dunk and it was just an athletic dunker and his creativity. Birthday boy Michael Jordan, FTW! Toronto Sports fans, I have good news. It seems we bounced off the bottom in August and things are looking up. At that time, the Jays, Leafs, Raptors, TFC and Argos were all in pretty dire straits. You'll have to click back for details. I called it a "brand new low", but as I type this today I'm pleased to report the Argos are Grey Cup champs, the Blue Jays are entering the pre-season as World Series favourites and both the Leafs and Raptors are on four game winning streaks. Heck, the Leafs might even make the playoffs for the first time since 2004. And let me tell you as someone who is watching both the Leafs and Raptors these days, they're both entertaining and full of hope, something that's been sorely lacking the past few years. The Toronto professional sports scene is suddenly respectable again. Go Jays Go! 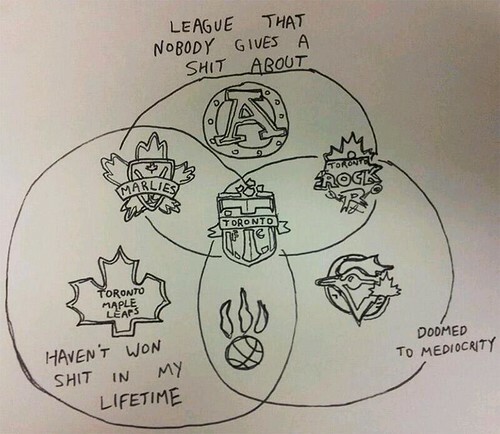 And go Leafs, Raptors and Argos, too! I'm not sure about TFC, but the other teams are headed in the right direction.